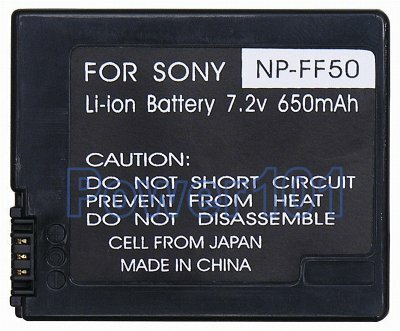 NP-FF50 is the smallest size battery in compatibility series FF50 and FF70. NP-FF50 is rated about 2 hours while FF70 about 4 hours. Time largely depends on the LCD usage. For an average use FF70 i highly recommended over one or two FF50. First, it is just a bit thicker - which still looks aestetically pleasing on the camcorder. Second - there are events such as birthdays that require more than 2 hours of filming. 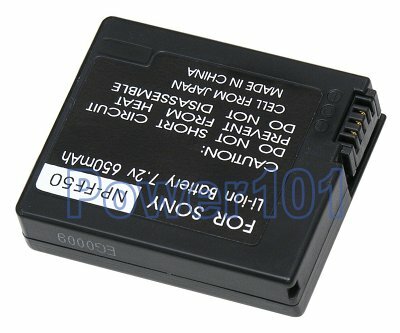 This battery is compatible with the following camcorders: Sony DCR-HC1000, DCR-IP1, DCR-IP200, DCR-IP210, DCR-IP220, DCR-IP45, DCR-IP5, DCR-IP55, DCR-IP5E, DCR-IP7, DCR-IP7BT, DCR-IP7E, DCR-P350, DCR-PC106, DCR-PC107, DCR-PC108, DCR-PC109, DCR-PC350. If you have a different camcorder, please check with our camcorder battery finder which battery you need. These batteries can be charged by any standard charger compatible with FF-series FF50 or FF70 batteries, plus they can be charged directly on the camcorder.